A plaque commemorates the exploration Sir William Landsborough and his Camp 33 site where he blazed the tree in 1862 . The plaque was erected as a Centenary of Federation Project in 2001. In 1861 Landsborough was chosen by the Victorian and Queensland governments to lead a search for Burke and Wills from the Gulf of Carpentaria southwards. In August the party left Brisbane in the brig Firefly, escorted by H.M.S. Victoria. 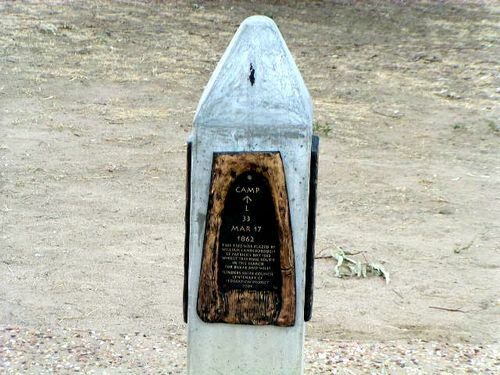 A depot was formed on the Albert River at the site of Burketown and in November the party of 8, including 4 Aboriginals, and 25 horses started south. Landsborough followed the Gregory River and named the Barkly Tableland but near the site of Camooweal found desert with a network of dry channels. Landsborough returned to the depot in January 1862. With supplies from the Victoria he led his men south. They encountered hostile Aboriginals on the Barcoo and on the Warrego their rations were reduced to boiled greenhide. On 21 May they reached Williams`s station and learned that Burke and Wills had perished. Landsborough continued his journey south and in October delivered the horses and gear to the authorities in Melbourne. He was feted as the first explorer to cross the continent from north to south.